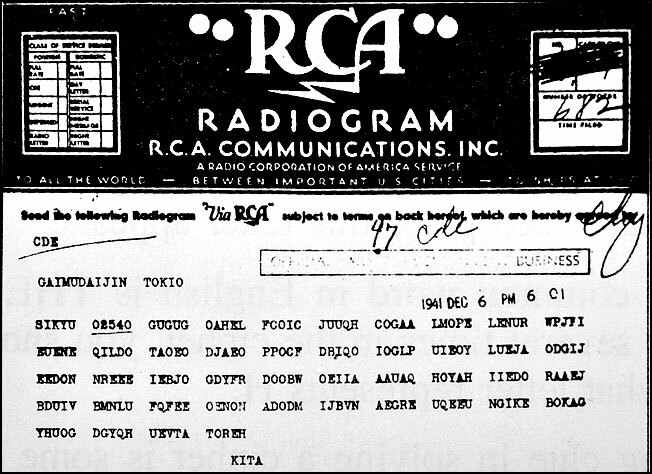 In the following example, a mutation in a word sequence is compared with the International Morse Code. If the code for S (3 dots) is changed to a dash + 3 dots, the letter B is represented. The addition of one dash changes the meaning of the entire message. A base substitution in a DNA sequence can change the meaning of an entire gene, resulting in an incorrect amino acid sequence and a faulty protein. This can be a critical mutation, particularly if the protein happens to be a vital enzyme. Like a point mutation in DNA, a one-letter substitution in a word can sometimes completely change the meaning of the sentence. This is especially true when speaking or writing in another language. In a store in Costa Rica I discovered that had no Costa Rican currency called colones, only U.S. dollars. In my meager attempt to speak Spanish to the clerk, I told her that I had no "cojones," inadvertently subsititing a "j" for an "l." When she replied: "I am sorry for you," I knew that my sentence was corrupted. In a vulgar translation, I essentially told the woman that I had no testicles! In this case, a one letter substitution (mutation) completely changed the meaning of the sentence. When cells divide abnormally they often develop into tissue masses called tumors. Tumors can be produced throughout the body and they can be malignant or benign. Malignant tumors are often referred to as cancers. Some human cancers are caused by viruses, such as certain forms of the herpes virus that causes cervical cancer. Most cancers are neoplastic tumors caused by mutations in the DNA of cells. These mutations interfere with the cell's ability to regulate and limit cell division. Dormant cells enter the M-phase of the cell cycle and begin to divide out of control. Mutations that activate cancer-causing oncogenes or repress tumor-suppressor genes can eventually lead to tumors. Cells have mechanisms that repair mistakes in their DNA; however, mutations that affect repair enzymes may cause tumors to form. One of the best examples of the latter mechanism is a basal cell carcinoma. Excessive exposure to UV radiation from the sun can cause mutations in undifferentiated basal keratinocytes (basal cells) of the epidermis. The specific mutation is called a thymine dimer within the DNA molecule. In normal DNA, the pyrimidine base thymine only pairs with the purine base adenine. When two adjacent thymine bases bond together this causes an abnormal configuration or "kink" in the DNA. Healthy cells can recognize and repair this mistake by excision repair enzymes. In some animals the mutation is repaired by DNA photolyase enzymes that clip out (cleave) the dimer. People with a genetic propensity for skin cancers may have insufficient repair enzymes due to mutations that repress the genes for these repair mechanisms. Although malignant basal cell carninomas generally do not metastasize, they may slowly invade deep layers of the skin and adjacent tissue and eventually be quite destructive. The following image shows the invasive growth of a basal cell carcinoma (technically a morpheaform bcc) that required the removal of about 1/3 of the author's nose. Unlike the nodule growth form of some basal cell carcinomas, the morpheaform bcc proliferates into deeper tissue with aggressive, tentacle-like branches. In addition to an increased number and density of dark-staining basal cells, the latter type of skin cancer produces a proliferation of fibroblasts within the dermis and an increased collagen deposition (sclerosis) that resembles a scar. The tumor appears as a whitish, waxy, sclerotic plaque that rarely ulcerates. It does not form noticeable scabs as in other skin cancers. On the surface of the author's ala (side of nose), this carcimoma resembled a small, concave scar; however, it had grown extensively into surrounding tissue. Although the sun is the vital energy source for all life on earth, it can also be a potent carcinogen. On a positive note for sun exposure, synthesis of vitamin D, a vitamin essential to human biological function, begins with activation of a precursor molecule in the skin by UV rays. Enzymes in the liver and kidneys then modify the activated precursor and finally produce calcitrol, the most active form of vitamin D. During most of the year, a few hours per week of sun exposure to the face and arms is sufficient to meet the body's requirement for the activated calcitrol precursor. In general, fair-skinned people live in northern latitudes with lower light intensity compared with dark-skinned people of the tropical latitudes. Dark skinned people produce greater concentrations of melanin which protects their skin from harmful rays of the sun. Basal cell carcinomas are rare in Blacks and Asians, compared with fair-skinned Whites. It has been suggested that fair-skinned people of northern latitudes might have a slight advantage in synthesizing vitamin D, especially during months of the year in regions with reduced light intensity. 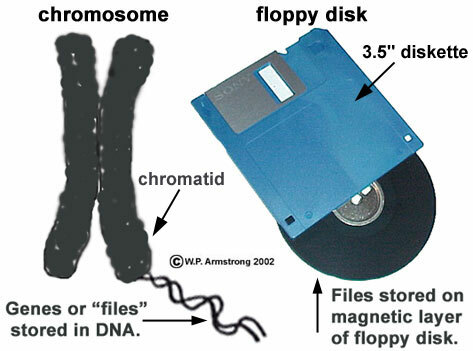 A simple comparison between a doubled eukaryotic chromosome (composed of two chromatids) and an ordinary floppy disk. Genes are stored as sections of nucleotides along the twisted, double-stranded DNA ladder which makes up each chromatid. In a sense, genes are like information files stored on the magnetic layer of a floppy disk. In this example, the entire chromosome could be compared with a floppy disk or CD. 1. Animal and plant viruses are macromolecular units composed of DNA or RNA surrounded by an outer protein shell. They have no membrane-bound organelles, no ribosomes (organelle site of protein synthesis), no cytoplasm (living contents of a cell), and no source of energy production of their own. They do not exhibit autopoiesis--i.e. they do not have the self-maintenance metabolic reactions of living systems. Viruses lack cellular respiration, ATP-production, gas exchange, etc. However, they do reproduce, but at the expense of the host cell. Like obligate parasites, they are only capable of reproduction within living cells. In a sense, viruses hijack the host cell and force it to produce more viruses through DNA replication and protein synthesis. Outside of their host cells, viruses can survive as minute macromolecular particles. Infectious human viruses can be dispersed though the air (airborne viruses causing influenza and colds) or body fluids (HIV virus). Epidemic viruses (such as HIV & hepatitis B) that are passed from person to person via sexual conjugation are remarkably similar to computer viruses. Unfortunately in humans there is no resident antivirus program to alert you of a potential infection, or to quickly scan your body and delete the invader once it has entered your system. Humans must rely on their amazing antibody and cell-mediated immune response, one of the most complex and remarkable achievements in the evolution of living systems. 2. Computer viruses are generally executable files that copy information to various sectors of your hard drive. Like human viruses, computer viruses replicate automatically by attaching to host software or disk sectors on your computer, usually without your knowledge. Boot viruses dwell in the boot sector of the hard drive or floppy disk that carries them. These execute as your computer starts or whenever your computer reads information from an infected floppy disk. Once they copy themselves into your computer's memory, they can then spread to other disks or other computers on a network, each time leaving copies of themselves that can repeat the cycle. Viruses often target files with certain extensions, often attacking Microsoft data and template files. [Perhaps the cleaver creators of these viruses have a malicious vendetta against the Microsoft monopoly.] In recent years, some very sophisticated viruses have been developed which combine both file-infecting and boot sector-infecting features. Just as certain strains of HIV can alter their protein shell so they are unrecognizable to your immune system, some computer viruses are able to disguise their code from your antivirus software. Human viruses are spread by the exchange of body fluids and extremely infectious airborne strains. Some of the most obnoxious modern computer viruses are spread very rapidly through the Internet, often as executable e-mail attachments. Worms are independent virus programs that send themselves around the Internet and launch themselves silently on computers of unsuspecting victims. Trojan horses are malicious programs that appear to be a useful application, such as a screen saver, handy utility or a nifty game. Once executed they can make a computer vulnerable to hackers or even destroy critical files on the hard drive. Like the immune system of animals (including T-cells, B-cells and antibodies), antivirus software identify potential viruses and destroy them before they spread rampantly throughout the infected computer's boot sectors and hard drive. Updating the antivirus dat files is like maintaining up-to-date vaccinations and booster innoculations against new viral strains. Unfortunately, in humans there is no way to back up your entire healthy body data and then simply restore it when you become infected. 1. A single strand of 24 DNA bases representing a gene. The gene starts with the base C and ends with the base C.
2. 14 Transfer RNA (T-RNA) molecules, each consisting of an amino acid (abbreviated by 3 letters within a box), and the base triplet of the corresponding anticodon (outside of the box). 3. The abbreviation and proper spelling of each amino acid. Transcription: Construct a strand of Messenger RNA (M-RNA) from the initial gene sequence. Remember that C in DNA becomes G in M-RNA, G in DNA becomes C in M-RNA, A in DNA becomes U in M-RNA, and T in DNA becomes A in M-RNA. The following shows the completed polypeptide with the correct order of amino acids that correspond with the mutant strand of DNA. Note that three amino acids (shown in pink) are different from the original polypeptide made from the original DNA strand. They are different because the codons changed as a result of the substitution of U (uracil) for C (cytosine). In three places along the strand, a different T-RNA anticodon matched up with the altered codons. Universal Codon Chart: All possible 64 M-RNA base triplets (codons) are shown, including all the corresponding amino acids that they code for. Since each letter of a codon has four possible letters (A, U, C or G) there are 64 different codons (4 x 4 x 4 = 64). Note: Some amino acids have multiple codons, 6 for leucine, 4 for valine, etc. Some amino acids have only one codon, 1 for methionine and 1 for tryptophan. Some codons translate into stop, which means do not add any more amino acids to the polypeptide. The reddish streaks on these corn grains are caused by transposons. Grains of Indian corn come in different colors, such as purple, yellow and white. Sometimes the individual grains are purple with white streaks or mottling. This mottling effect defies Mendel's basic principles of genetics because individual grains may be multicolored rather than a single color. The movement of transposons on chromosomes may result in colored, non-colored and variegated grains that do not fit traditional Mendelian ratios based solely on chromosome assortment during meiosis and random combination of gametes. The explanation for this phenomenon involves "jumping genes" or transposons, and earned Dr. Barbara McClintock the prestigious Nobel Prize in Medicine in 1983 for her life-long research on corn genetics. Transposons are genes that move from one location to another on a chromosome. In the pigmented aleurone layer of corn grains, the position of transposons may inhibit or block pigment production in some cells. For example, if the transposon moves to a position adjacent to a pigment-producing gene, the cells are unable to produce the purple pigment. This results in white streaks or mottling rather than a solid purple grain. The duration of a transposon in this "turned off" position affects the degree of mottling. If the pigmentation gene is turned off long enough by a transposon, the grain will be completely unpigmented. The reddish-purple patterns caused by transposons may be blotches, dots, irregular lines and streaks. When a transposon moves to different positions within cells of the corn kernel, the coloration gene is "turned on" or "turned off" depending on whether it lands in a position adjacent to the pigmentation gene. Transposons may also have a profound effect on embryonic development and tumor formation in animal cells. Oncogenes (genes that cause tumors) may be activated by the random reshuffling of transposons to a position adjacent to the oncogene. Transposons may also be useful in genetic engineering with eukaryotic cells, by splicing in transposons to activate certain genes. The implications from Barbara McClintock's discovery of transposons may be far-reaching and as significant as Watson and Crick's discovery of the structure of DNA. Federoff, N.V. 1984. "Transposable Genetic Elements in Maize." Scientific American Volume 250 (Number 6): 84-98. In eukaryotic cells, the initial messenger RNA (M-RNA) transcribed from the DNA (gene) is modified (shortened) before it leaves the nucleus. Sections of the M-RNA strand called introns are removed, and the remaining portions called exons are spliced together to form a shortened (edited) strand of mature M-RNA that leaves the nucleus and travels to the ribosome for translation into protein. Perhaps the deleted sections (introns) were needed by our ancestors, but are no longer necessary. In fact, this hypothesis was actually utilized in an episode of Star Trek: The Next Generation. In this episode the crew was reverting back to their ancestral state because their introns were reactivated. A genome may be defined as all of the functional genes in an organism, including haploid and diploid organisms, and viruses. Total genomic DNA includes genes of the nucleus, nucleolus and cytoplasmic organelles, including chloroplasts and mitochondria. Polyploid organisms also have one genome. For example, a tetraploid plant has one tetraploid genome composed of four haploid sets of chromosomes. The mule genome is composed of one set of donkey chromosomes and one set of horse chromosomes. A lichen genome is composed of the DNA from two symbiotic organisms that live together in one body, the photosynthetic alga (photobiont) and heterotrophc fungus (mycobiont). The Human Genome Project is a worldwide endeavor to map the DNA base sequence of every gene in the human genome. As of February 2001, the total number of functional genes is considerably less than expected, about 30,000 genes per cell compared with previous estimates of 100,000 genes per cell. It has been estimated that a human somatic cell contains about 5 billion base pairs. If the average gene contains 1500 bases, then 30,000 functional genes is only about one percent of the total DNA per cell. Cottonwood Tree Has More Genes Than A Human? Although DNA sequences for all the genes in some animal species have be published, relatively few plant genomes have been mapped. According to Gerald Tuskan of Oak Ridge National Laboratory, Tennessee, the black cottonwood (Populus trichocarpa) genome has now been determined. His team identified more than 45,000 putative protein-coding genes. The human genome, by comparison, is thought to contain 20,000 to 30,000 functional genes. In this comparison, the morphological complexity of an organism is certainly not reflected by the number of genes. Knowing the genome of a tree like the black cottonwood may be very benefical to an energy-demanding world. It may enable researches to manipulate biochemical pathways in the tree to make a better renewable biofuel source. For example, black cottonwoods already grow and resprout very quickly in a small space. Researchers could make the trees contain a higher proportion of cellulose to lignin, which is easier to convert into sugars and ethanol. Tuskan, G., et al. 2006. Science 313: 1596 - 1604. Like tumorous growths, some galls can be very destructive to the host plant. In fact, crown gall (caused by the bacterium Agrobacterium tumefaciens) can cause serious damage to orchard trees. Crown galls are especially interesting because the plasmids of this bacterium (small, circular DNA molecules) contain genetic information that may become incorporated into the nuclear DNA of the infected host cells. These plasmids are referred to as tumor-inducing or Ti plasmids. The Ti plasmid DNA contains genes which cause the host cells to divide uncontrollably. In a sense, the plasmids are like floppy disks containing files or "genes" which are loaded into the host DNA. This explains why these "plant tumors" continue to grow even when the bacteria are eliminated. Ti plasmids are a powerful tool for genetic engineering in plants because the tumor-inducing genes can be replaced with beneficial genes. Agrobacterium tumefaciens containing genetically-engineered (recombinant DNA) plasmids can then be used to transfer the beneficial genes into the host DNA of an infected plant. For example, bacterial genes for insecticidal proteins have been transferred into tomato plants, resulting in transgenic plants that are resistant to ravenous lepidopteran larvae. The protein toxin actually kills the caterpillars feeding on the plant. Massive crown gall at the base of an adventitious stem of an apple tree. Note the enlarged swellings on the roots. This plant disease is caused by the soil bacterium (Agrobacterium tumefaciens). Another species of bacteria (Bacillus thuringiensis) also referred to as BT, has natural insecticidal properties. This common soil bacterium produces proteins that are especially toxic to alkaline insect stomachs, but not to the acidic stomachs of mammals. These BT proteins have been found to be remarkably effective against a wide range of caterpillars and worms, including peach tree borers, European corn borers, cotton boll worms, cabbage worms and loopers, tomato and fruit hornworms, tent caterpillars, fall webworms, leaf miners, alfalfa caterpillars, leaf rollers, gypsy moth larvae and cankerworms. According to T.D. Brock and M. T. Madigan (Biology of Microorganisms, 1988), Bacillus thuringiensis forms a crystalline protein during sporulation called a parasporal body. The toxic component of the crystalline body is delta endotoxin. BT bacteria are readily mass-produced by commercial companies and are sold in the form of a stable wettable dust containing millions of spores and crystalline bodies (or just the crystalline toxin). When a caterpillar ingests any plant tissue with BT spores and crystals on it, the delta endotoxin causes deterioration of the intestinal lining and paralysis of the insect's gut. In addition, the bacteria quickly become active and invade the host causing lethal septicemia (blood poisoning due to pathogenic bacteria in the bloodstream). The use of fungal and bacterial spores as microbial insecticides is becoming an increasingly popular method of "biological control." Advocates of this method of insect control maintain that it is safer and more effective than traditional nonspecific poisons (biocides) that kill many life forms. In addition, the lethal biocides enter the food chain and become concentrated along successive trophic levels, a serious condition known as "biological magnification." Another potent tool used in genetically modified (GM) plants is the cauliflower mosaic virus (CaMV) 35S promoter. [The promoter is a short sequence of DNA that defines the start of a gene, the direction of transcription, and the strand of DNA to be transcribed. It is one component of an operon, a group of structural and regulating genes that functions as a single unit. Transcription begins when the enzyme RNA polymerase attaches to the promoter.] The CAMV promoter is used in many GM plants because it is more powerful than other promoters, is active in both angiosperms and gymnosperms, and is not greatly influenced by the environment or tissue type. The presence of CaMV promoter DNA in food crops is evidence of transgenic contamination. Other genetic sources of transgenic contamination include DNA sequences from Agrobacterium tumefaciens and Bacillus thuringiensis. In the everchanging world of biotechnology, the genes for BT proteins have now been isolated and introduced into the DNA of corn plants (Zea mays), tomatoes (Lycopersicon esculentum) and potatoes (Solanum tuberosum). One of the transgenic corn hybrids, called "starlink corn," produces a toxic BT insecticide in its tissues that is lethal to corn borers and other destructive insect pests. Genetically modified (transgenic) food plants (GM plants) have become a controversial issue in recent years, especially in Europe. Many people are very concerned about the potential dangers of altering the genomes of food plants. For example, the transgenic starlink corn was originally designed as animal food, but due to human error it inadvertently got into corn tortilla shells used for human consumption. As of winter 2001, many people are afraid to eat corn chips and other corn products, because of their concern over BT insecticides in the corn. Another concern about transgenic plants containing BT insecticides is that they may be toxic to beneficial insects. For example, it has been shown that pollen from these plants is lethal to the larvae of monarch butterflies, particularly if it lands on nearby milkweeds which the larvae feed upon. The widespread destruction of beneficial insects could be very detrimental to animals that feed on these insects, and could upset the complex food web of an ecosystem. Since corn is wind pollinated, there is also the possibility of BT genes being inadvertently transferred to other varieties of corn plants. This could theoretically contaminate the genomes of other corn plants, including Mexican teosinte, the ancestral corn that provides the natural genetic reservoir for all the hundreds of varieties of modern corn. According to S. Nelson (The SeedHead News, Spring 2002), transgenic DNA (GM corn) was recently found among samples of native corn landraces in the mountains of Oaxaca, Mexico. Whether all these concerns can be substantiated by rigorous scientific investigation remains to be seen. The genes of sterile transgenic crops, such as bananas, are not as likely to escape into the environment through seeds or pollen. Because edible bananas do not produce seeds, new groves are planted from cuttings of existing stock; however, this asexual propagation also spreads diseases and pests, such as the black sigatoka fungus, nematodes and weevils. Modern tissue culture methods will allow existing strains to be reared in a disease-free environment resulting in clean planting stock. Genes from other banana strains can also be inserted into existing stock to produce disease resistant, transgenic strains. DNA is such an amazing molecule that it makes great material for "gee-whiz" trivia. Although some of the trivia presented here are based on facts, I have also included some fantastic propositions and preposterous mathematical projections that are impossible to observe, difficult (if not impossible) to prove, and beyond the scope of genuine trivia. A single human nucleus five micrometers in diameter (0.005 mm) contains 46 chromosomes (2 haploid sets). When completely uncoiled this amounts to an estimated six feet of DNA. With an average of 60 trillion cells per person, this amounts to 68 billion miles of DNA; enough DNA to stretch to the sun and back 365 times or 140,000 round trips to the moon. If the nucleus were enlarged to five feet in diameter, the uncoiled DNA in one nucleus would extend 46 miles, about one mile per chromosome. Each gene would be about five to ten feet long. The amount of DNA stored in a single human nucleus invisible to the naked eye is enormous. In terms of printed information using a 26 letter Roman alphabet and 12 characters per inch, this information represents about 500 volumes of Encyclopedia Brittanica. All this is stored in a microscopic nucleus five micrometers in diameter (smaller than a human red blood cell). A computer chip is gigantic by comparison and stores much less data. If a human cell contains five billion base pairs, this represents 45,000,000,000 or 103,000,000,000 different possible base sequences. This astronomical number has three billion digits and would fill about one million pages on a computer printout (12 cpi). This incredible number helps to explain the enormous diversity of life forms on earth, from viruses and bacteria to complex plants and people, all genetically programmed by DNA. Flowering plants alone range from tiny wolffias less than one millimeter long to huge eucalyptus trees over 100 meters tall. RNA Interference (RNAi) is a promising technique used to "silence" or "turn off" genes. RNAi may be described as a type of gene therapy that takes advantage of an intermediate step between DNA and protein in the cytoplasm of cells. It involves a complementary "antisense" strand of RNA that binds to a "sense" strand of messenger RNA (M-RNA) transcribed from a target gene in the nucleus. This triggers the natural degradation of the "sense" strand of M-RNA, thereby blocking the translation of this particular M-RNA at the ribosome. In RNAi, double-stranded RNAs (called dsRNAs) that are complementary to known M-RNAs are introduced into a cell to specifically block and destroy a particular M-RNA. There are many potential uses for this type of gene therapy in medicine, particularly involving deleterious recessive genes causing diseases in people. RNAi is also useful in determining exactly which of the thousands of M-RNAs control the thousands of expressed genetic characteristics of plants and animals. This is analogous to turning off individual circuit breakers of a house to determine which circuits and rooms are controlled by specific breakers.